On this week's episode Sean catches up with Nick Holland from the EJ Whitten Foundation as part of the Sports Geek Podcast CEO Series. Sean chats with Nick about football, law, governance and blockbusters. 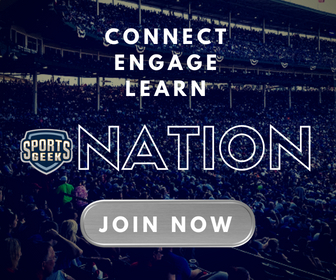 Attend #SBWeek17 sports business networking event in your part of the world. Last week we launched CrowBot for the Adelaide Crows, the first AFL club to launch a Messenger Bot. Learn more about CrowBot from Adelaide Crows, congrats to Kieron Turner and the Crows digital team in helping us pulling it together. We built the CrowBot in partnership with Tradable Bits as part of our Sports Geek Campaigns partnership. Stay tuned for more campaigns and chatbots as part of this partnership. Interested in getting your team a chatbot? Contact us.